A few years back we did some signs for Amber Interiors, a design studio that has a home and lifestyle store in Calabasas, California. Since then, their business has been growing and they now have a second physical location in the Pacific Palisades. They recently reached out to us because they were interested in getting graphics for their new company van. You can see the graphics that we made and installed in the pictures in this article. 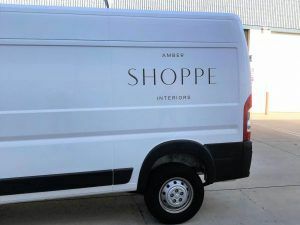 Being a design studio, Amber Interiors already had a design concept for the vehicle graphics, and provided us with all of the necessary information we needed. Right after they first contacted us about their new order, they provided us with a mockup of what they wanted the graphics to look like, measurements, font files, vector files, and the specific color they wanted. Working with a design firm is great because they already know exactly what they want, they just need a sign manufacturing company like us to make their ideas into a reality. Using the measurements they provided, we digitally laid out the graphics on the van to figure out how much vinyl we were going to need. 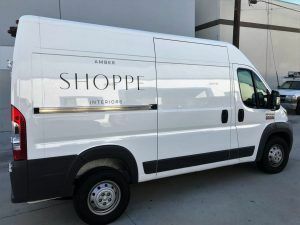 For vehicle graphics, we use Avery Dennison brand car wrap material. The material comes in white and we digitally print the color, logo, image, etc. onto the material. In this case, Amber Interiors wanted lettering that was off-black so we printed the color that they provided through their AI file. Once the graphics were ready, they brought the van in for installation. The lettering is application taped and each graphic is usually applied at once. 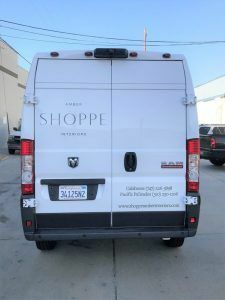 Our installers have years of experience with vehicle graphics and our vinyl graphics are always applied carefully to make sure they are straight and even with no bubbles underneath.